BEFORE: Growing up I was always very active! This made me feel confident inside and out and in return I loved the person I was. As I got older I had to take on more responsibilities but still found the time to continue to do what I loved. At the age of 27 I found out I was pregnant with my daughter yet I still continued to work out with my doctors permission. After she was born I tried to get back in the swing of things and failed so many times. I’ve lost all confidence in myself and my ability to actually be able to live a healthy life for my daughter until I heard about your programs. I decided to make a commitment to myself and my daughter by joining your program. I love how motivating you are and all the materials you give to help men and women better themselves. 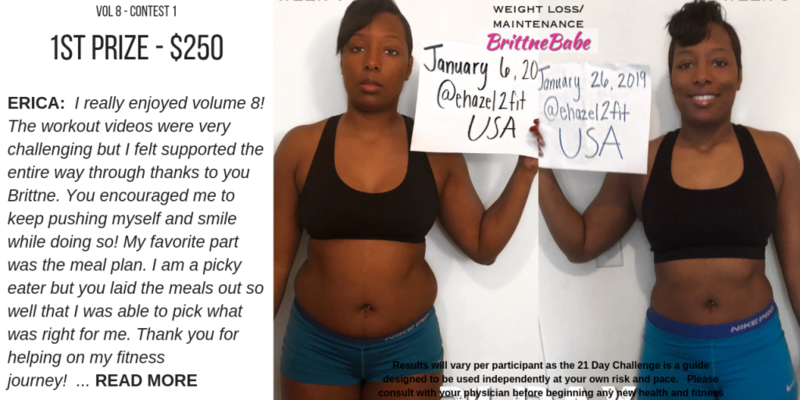 I wanted to be strong and health and I know I can get my confidence back with your help! 21 Days AFTER: I really enjoyed volume 8! The workout videos were very challenging but I felt supported the entire way through thanks to you Brittne. You encouraged me to keep pushing myself and smile while doing so! My favorite part was the meal plan. I am a picky eater but you laid the meals out so well that I was able to pick what was right for me. Thank you for helping on my fitness journey!